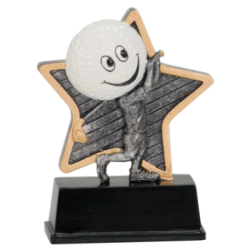 Golf Ball spins a full 360 Degrees and has an exciting motion(lenticular) Star card with Custom Engraving. This award includes a FREE engraved Gold-Tone Metal plate! You supply your text via an email or by above Text Boxes. 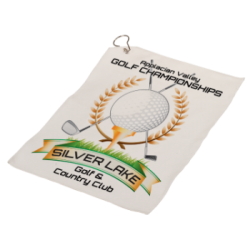 Up to three lines of text can be engraved..
Small Microfiber Golf TowelTROPHY SIZEPlease reference the table below for size. These are the measurement of overall size of Trophy. SIZE 7 1/2" X 13" You supply your text via an email or by above Text Box. 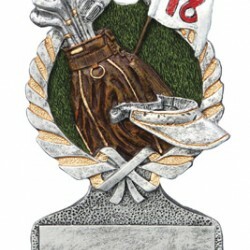 Up to three lines of text can be engraved on the plate, with up..
Little Pal Golf ResinTROPHY SIZEPlease reference the table below for size. These are the measurement of overall size of Trophy. SIZE 5" You supply your text via an email or by above Text Box. 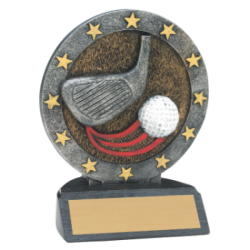 Up to three lines of text can be engraved on the plate, with up to 30 character..
Small All Star Golf ResinTROPHY SIZEPlease reference the table below for size. These are the measurement of overall size of Trophy. SIZE 4 1/4" You supply your text via an email or by above Text Box. 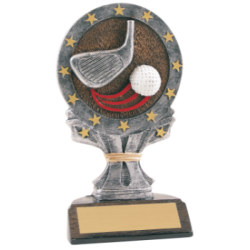 Up to three lines of text can be engraved on the plate, with up to 30 c..
Large All Star Golf ResinTROPHY SIZEPlease reference the table below for size. These are the measurement of overall size of Trophy. SIZE 6 1/4" You supply your text via an email or by above Text Box. 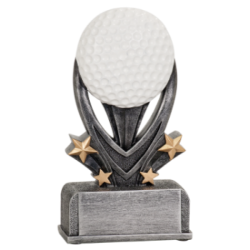 Up to three lines of text can be engraved on the plate, with up to 30 c..
Full Color Resin Golf 5" Trophy with Custom Engraving. 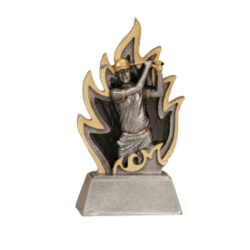 This award includes a FREE engraved Gold-Tone Metal plate! You supply your text via an email or by above Text Boxes. Up to three lines of text can be engraved on the plate, with up to 30 characters per.. 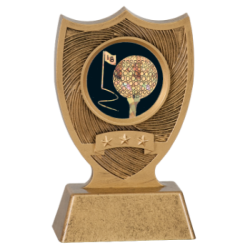 Sport Sheild Resin With Golf InsertTROPHY SIZEPlease reference the table below for size. These are the measurement of overall size of Trophy. SIZE 6" You supply your text via an email or by above Text Box. 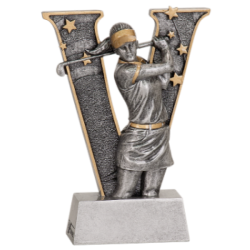 Up to three lines of text can be engraved on the plate, ..
"v" Series Female Golf ResinTROPHY SIZEPlease reference the table below for size. These are the measurement of overall size of Trophy. SIZE 6" You supply your text via an email or by above Text Box. 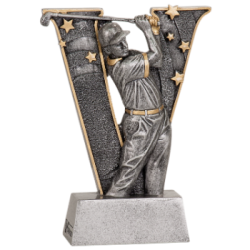 Up to three lines of text can be engraved on the plate, with up to 3..
"v" Series Male Golf ResinTROPHY SIZEPlease reference the table below for size. These are the measurement of overall size of Trophy. 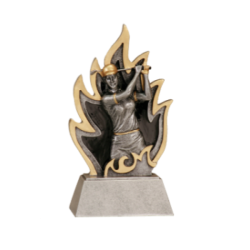 SIZE 6" This award includes a FREE engraved Gold-Tone Metal plate!You supply your text via an email or by above Text Box. Up to three.. Varsity Sport Golf ResinTROPHY SIZEPlease reference the table below for size. These are the measurement of overall size of Trophy. SIZE 7" You supply your text via an email or by above Text Box. Up to three lines of text can be engraved on the plate, with up to 30 charac..
Ignite Female Golf ResinTROPHY SIZEPlease reference the table below for size. These are the measurement of overall size of Trophy. SIZE 6 1/2" You supply your text via an email or by above Text Box. Up to three lines of text can be engraved on the plate, with up to ..
Ignite Male Golf ResinTROPHY SIZEPlease reference the table below for size. These are the measurement of overall size of Trophy. SIZE 6 1/2" You supply your text via an email or by above Text Box. Up to three lines of text can be engraved on the plate, with up to 30 char..